What the blurb says: “Stephen Killigan has been cold since the day he came to Cambridge as a senior lecturer. Something about the seven hundred years of history staining the stones of the university has given him a chill he can’t shake. When he stumbles across the body of a missing beauty queen, he thinks he’s found the reason. But when the police go to retrieve the body they find no trace of it. Killigan has found a problem – and a killer – that is the very opposite of reason. Wow. Wow. Wow. They are the first three words (or one word repeated) that comes into my mind on finishing The Beauty of Murder. This is a literary crime thriller which ticks all the boxes with a flourish: intriguing characters, fascinating storylines, gorgeous settings, beautiful prose and a sprinting pace. And it’s A K Benedict’s debut novel. Stephen Killigan is a likable guy – he’s smart, likes a beer (or two, or more), and is looking for love. He also wants to do the right thing when he discovers the body of a missing woman. But being a good citizen soon turns out to be the start of a journey that threatens to destroy all he holds dear. When the police find no trace of the body, Stephen is determined to find out what happened to her. But as he finds clues to the mystery, each one makes less sense than that before it. Is he losing his mind as so many suggest? As the body count rises, and the links of the modern-day murders with those in 1635 become clearer to him, Stephen becomes the prime suspect. Yet he finds an unlikely friend in Inspector Jane Horne, who is trying to solve the series of seemingly unsolvable cases whilst keeping her own private health battles secret from those at work. The Beauty of Murder is filled with unusual, memorable supporting characters like Stephen’s friend, Satnam, who likes a few beers and loves the girl in the library, and Robert Sachs, the “poncey philosopher who loves himself” who muses over the beauty of the dead. I think my favorite of these is Iris Burton, the eccentric academic who takes it upon herself to teach Stephen Killigan about time travel including what to carry in your kit bag and how to avoid paradoxes (in my mind she was played by Helena Bonham Carter!). The relationship between Stephen Killigan and Jackamore Grass has real Sherlock/Moriarty feel to it: two highly intelligent men pitting their wits (and their lives) against each other to solve the mystery (in Stephen’s case) and win the game (in Jackamore’s case). Jackamore, who finds getting away with murder tiresomely easy, is pleased to at last have a worthy opponent, but as Stephen hones his skills and closes in on the truth, Jackamore starts to pick his victims from those close to Stephen. Quirky, mind (and time) bending, and compulsively addictive, this is an outstanding literary crime thriller. I can’t wait to see more from this author. 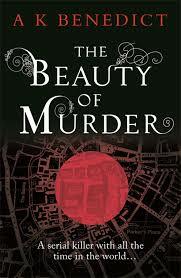 The Beauty of Murder is out on 10th April in paperback and available for pre-order over on the Amazon website right now. It sounds totally up my alley. I had recently been thinking of crime fiction related in any way to college and this one just falls totally into that category. Becase, you know, academics can be murderous as well!